If you have never owned a robot dog before, maybe you should start with a Newborn. This way you can raise your puppy the way that you want it raised. 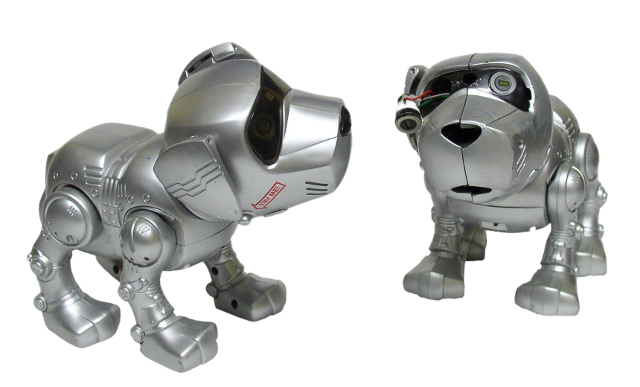 All joking aside, this thing is exactly like the Tekno Puppy, just with a slightly less mature personality. You can teach it tricks, pet it, feed it (with a special magnetic bone) or put it to sleep - that's my favorite trick! I have too short an attention span to take care of a pet much less a robotic version. There is a 'ball' that Newborn can play with, and if you place it behind his 'magic trick' fence, Newborn can find it. You can determine the mood (and thereby how good of a parent you are) by the look in his eyes.